Welcome to Seafood Recipe News - 7 Sensational Salmon Recipes. With each recipe, I will give you serving suggestions so you know exactly what you're going to cook and what you need to shop for. 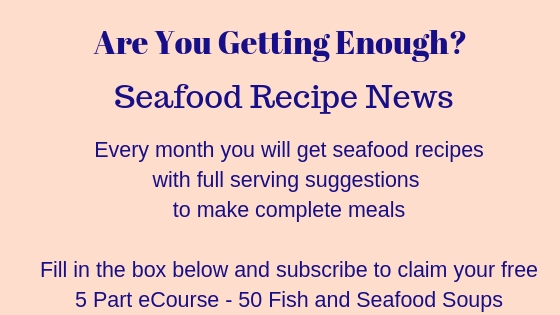 Seafood is very good for you and salmon is particularly high in the 'good' oils which are recommended for heart health. So, enjoy - please drop me a line or post a comment on the Facebook page if you have any questions or feedback. 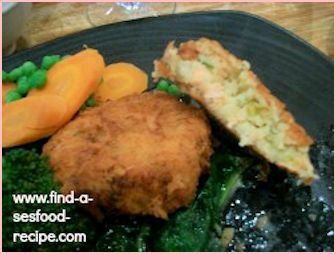 Salmon Patties or Fish Cakes depending on what your family calls them. These can be made with fresh or canned salmon - both equally tasty. It's a good way of getting the kids to eat fish and real comfort food for adults too. 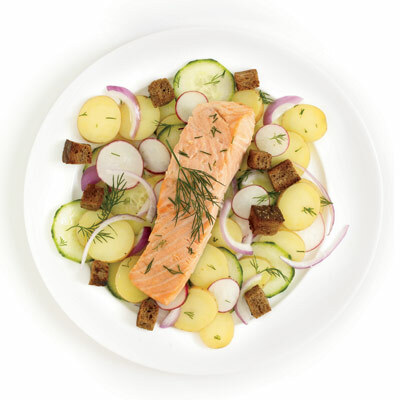 This Scandinavian Salmon Salad would be just right for a dinner party. There's dill, croutons, cucumber, onion, radish and new potatoes included already. I would say that unless you're having several courses, then you'll need to double up on the potatoes and dressing - it's a bit of a 'skinny' portion otherwise. This is a meal in itself, needing nothing adding to it other than maybe some crusty bread to mop up the dressing. World famous Jamie Oliver demonstrates how to cook Pan Fried Salmon with Tomato Couscous. He claims 12 minutes, but his knife skills are very good - I would say, watch the video and prepare everything ready to go in the pan before you start! It's a one pan meal for two people - you could easily increase quantities though for more. Heart healthy, low calorie, full of flavor - there's nothing to dislike. Everything you need is in the pan, so no serving suggestions required for this one. This Salmon en Croute recipe uses canned salmon and frozen pastry. It takes about twenty minutes to prepare and thirty minutes to bake - super simple and very tasty. The video is a bit of a laugh - they're pretending to cook in the galley on a fishing trawler at sea. The serving suggestion there is buttered potatoes and peas - I would add perhaps some mac and cheese or cauliflower with cheese sauce as the pastry would be dry and it would be nice to have some sauce. Definitely enough for four good servings here and another great way to get the kids to eat some fish - remember, canned salmon has all the oily properties of fresh. 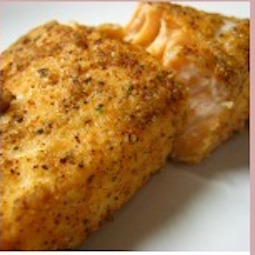 A very quick Baked Salmon recipe using salmon steaks, dill and seasoned flour. Quick to assemble and cook. Preheat your oven and it should be ready in under 15 minutes. 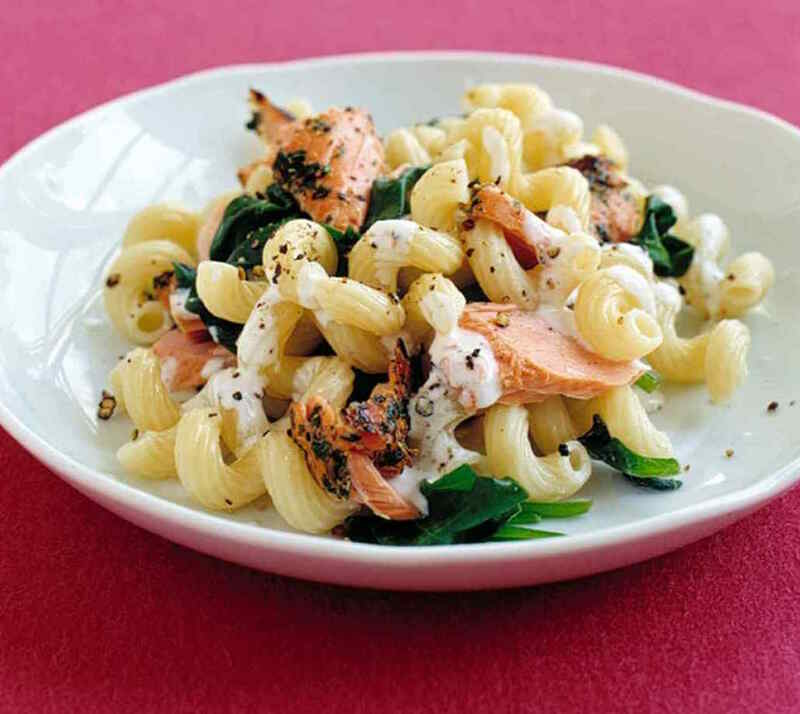 This recipe for Salmon Pasta comes from Martha Stewart. There's a short video which accompanies it to show you how to put it all together. It's an excellent midweek meal, being less than thirty minutes to put together. It looks to be quite generous portions for three or four people - the only think I might add is some fresh crusty bread to mop up the sauce. The method of cooking this salmon fillet would also be good as an entree. This method of Poaching a Whole Salmon from BBC GoodFood gets round the issue of needing a fish kettle or having to chop the salmon into pieces to fit your pan. Poaching can be tricky as it's hard to get the gentle simmer required - fish sometimes breaks up if the poaching liquid bubbles too fiercely. I would venture to say that the method is foolproof, unless you drop the salmon transferring it from the foil sheet to the serving plate! This is most definitely a centerpiece for a buffet, say a wedding, christening or anniversary. 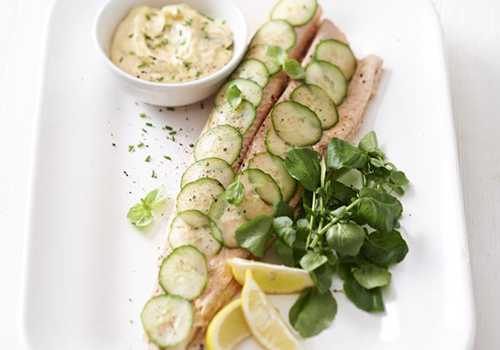 A great selection of salmon recipes for every occasion - lunch through to dinner parties.